Until now, SeaNet Fractional Yachts has only offered its clients fractional ownership and use of 18 to 24 metre yachts in South Florida, the US West Coast and a few other select locations, but its new SeaNet International Fleet Program has just expanded its cruising grounds considerably to the Caribbean, the Mediterranean (east and west), the US East Coast, the Bahamas and Mexico, with a 28 metre Benetti Delfino the vessel of choice. Owners buying into the Program have all the benefits of luxury yacht ownership without the hassle of staffing, maintenance, berthing and servicing. Shares start at €1,735,000 and, together with a portion of the operating expenses, give you a minimum of 50 days aboard a fully crewed Benetti Delfino 93 in any of these destinations. The fleet will start off with four Benetti yachts, which, according to SeaNet Fractional Yachts president and CEO Michael Costa, will be 'spec'd with every conceivable option' and yacht management services will be provided by Fraser Yachts. The Benetti Delfino 93 was chosen for its style, seaworthiness and interior volume, which makes it feel like a much larger yacht. The layout accommodates 10 to 12 guests in a main deck master and four guest cabins, two of which have Pullmans making them perfect for children. An open main deck living and dining area along with the aft deck and sun deck with bar, seating, sun pads and a spa pool offer ample space for entertaining, spending time with family and friends or relaxing. Interior decor will be contemporary beach resort chic. 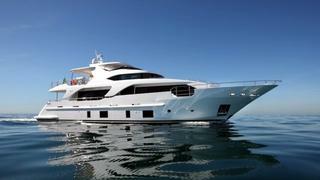 Along with this the Delfino 93 has Benetti Exclusive Sea Technology electronic systems, an at-anchor yacht stabilisation system and RINA classification. Established in 2003, SeaNet has its headquarters in Newport Beach, California and affiliated sales offices in Monaco, Palma, London, Newport - Rhode Island, New York and Fort Lauderdale. It offers three programmes that provide a financially savvy alternative to traditional yacht ownership, giving clients access to luxury yachts without taking an equity position, through its SeaNet Card Program.